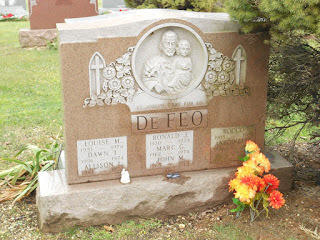 This monument is to the DeFeo family, who were all murdered in their Amityville, LI home in November of 1974. Ronald DeFeo Sr., his wife Louise, and four of their children were shot to death by their eldest son, Ronald Jr., who blamed the murder on a mafia hitman. He was found guilty at trial and is serving a life sentence. This sensational case spawned a number of books, including the Amityville Horror, a book based on the Lutz family's account of the brief (less than a month) period they lived in the house, a year later. George and Kathy Lutz claimed they had been terrorized by paranormal phenomena while residing in the house. To this day, the house at 112 Ocean Ave. remains an object of curiosity.